United States. Defense Mapping Agency. Hydrographic/Topographic Center. 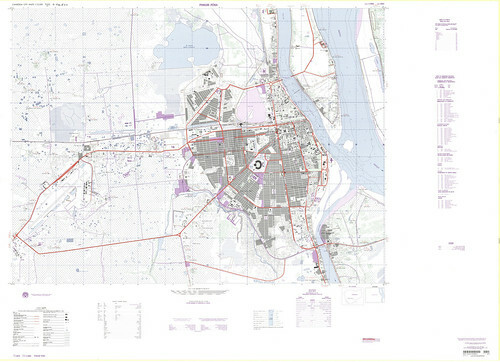 Cambodia city maps 1:25,000. 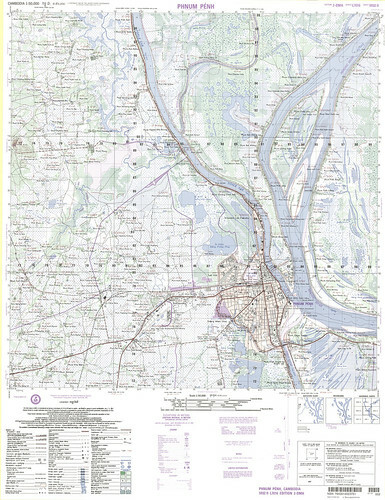 Phnum Pénh / prepared and published by the Defense Mapping Agency. Hydrographic/Topographic Center, Bethesda, Md. [Bethesda, Md.] : Reprinted by NIMA, 2001. Scale 1:25,000 ; transverse Mercator proj. (E 104°49ʹ15ʺ–E 104°57ʹ16.1ʺ/N 11°36ʹ37.03ʺ–N 11°31ʹ07.05ʺ). Hollis Record. Full size JPG. And this one from a series map available at Pusey. Full size JPG. During my thesis a friend of mine, Jeff Warren of Grassroots Mapping and the MIT Media Lab, introduced me to the concept of open source mapping. When my thesis site – Neft Dashlari (Oil Rocks) showed up on Google Earth only in name – he offered some tips on how to find other maps and posted them to the website. Another example: during the BP Gulf Oil Spill the group used grassroots mapping to map the extent of the oil spill – thereby offering an alternate narrative to the one told by the mainstream press. Open Street Map is a project that engages the public in the project of developing digital map data comparable with Google maps. Geofabrik was created out of the conviction that free geodata created by projects like OpenStreetMap will become increasingly attractive for commercial uses. 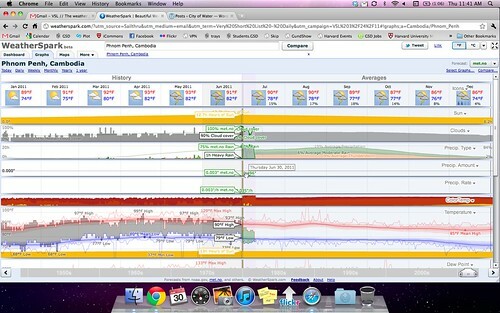 The United Nations Environnment Progarm GIS Data Bank. I met yesterday with Paul Cote, the GSD GIS (Geographic Information Systems) guru – who has developed an amazing GIS Manual. The Harvard Library system also offers a very basic GIS tutorial and an introduction to GIS. GIS is new to me – until now I have mapped used Adobe Illustrator – which I think made a proper geographer like Paul cringe a bit. According to Wikipedia: A geographic information system (GIS), geographical information system, or geospatial information system is a system designed to capture, store, manipulate, analyze, manage and present all types of geographically referenced data. In the simplest terms, GIS is the merging of cartography, statistical analysis and database technology. GIS may be used in archaeology, geography, cartography, remote sensing,land surveying, public utility management, natural resource management, precision agriculture, photogrammetry, urban planning, emergency management, environmental contamination, landscape architecture,navigation, aerial video and localized search engines. The GLCF is a center for land cover science with a focus on research using remotely sensed satellite data and products to assess land cover change for local to global systems. 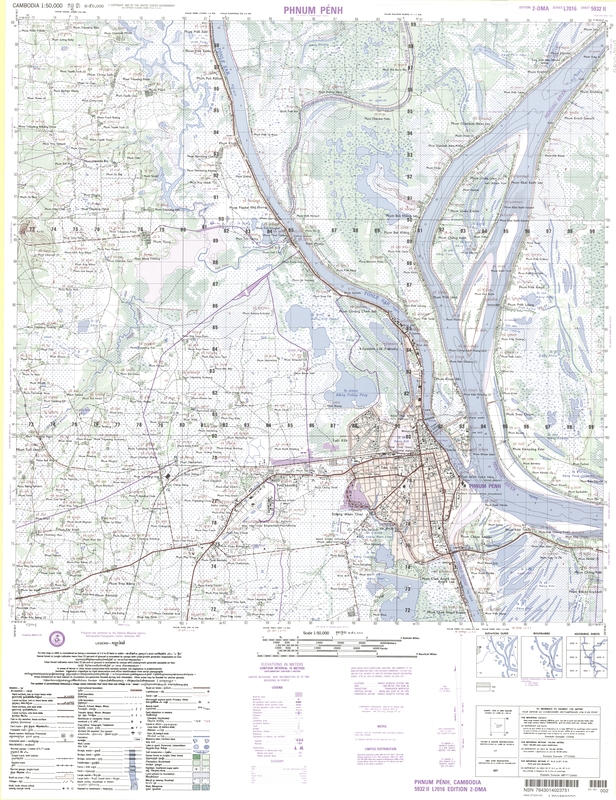 The historical map collection has over 27,800 maps and images online. The Harvard Geospatial Library offers search tools for finding geographic data, GIS data for download, and on-line geographic data exploration tools. 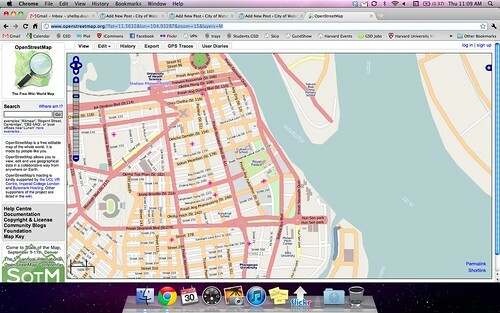 This site facilitates full color mapping of world to street level geography. Users can also view and print historical and atlas maps, flags, facts, and even portions of Mars. Here users can produce basic thematic maps using 2000 US Census data. Users can also download the tabular information or map image. 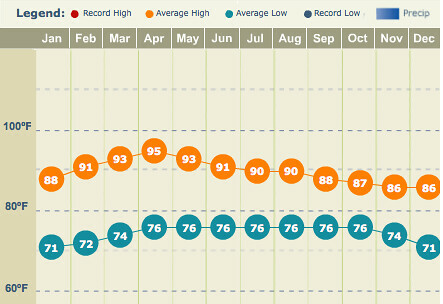 Averages, from weather.com (June 30, 2011). 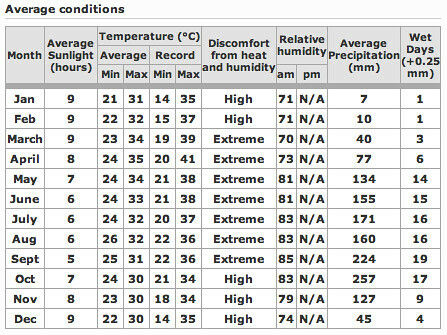 Averages, from the BBC Website (June 30, 2011). Widener’s acquisitions from East, South, and Southeast Asia are primarily in English and other Western languages; however, this section also has responsibility for Sanskrit and Tibetan publications. Access to additional materials from those areas in Western and Asian languages is provided by Harvard’s membership in the South Asia Microforms Project, the Southeast Asia Microforms Project, and the Center for Research Libraries. The central collection of publications in East Asian languages (Chinese, Japanese, Korean, Vietnamese, Manchu, Mongolian) is in the Harvard-Yenching Library, supplemented by the collections in the Law School Library, the Rubel East Asian Collection (Fine Arts), and the Reischauer (Japan) and Fairbank (China) Centers libraries. South Asian languages in Arabic script are collected by the Middle Eastern Division in Widener. For more information contact Dr. Raymond Lum, Asian Bibliographer, at rlum@fas.harvard.edu . The Vietnamese Collection of the Harvard-Yenching Library focuses on humanities and social sciences and is particularly strong in history and literature. Highlights of the collection include a complete set, on microfilm, of the Imperial Archives of the Nguyen Dynasty and rich holdings of the earliest Vietnamese-language newspapers and periodicals from the 1920s and 1930s. It also contains a number of 19th-century publications written in classical Chinese on Vietnamese history, law, political institutions, and Buddhism. In conjunction with the Vietnamese-language holdings of the Law School Library, the Fine Arts Library, and the Harvard Map Collection, the Vietnamese collection of the Harvard-Yenching Library plays an important role in supporting all Vietnam-related teaching and research activities at Harvard. Questions and comments, including requests for materials and inquiries about how to use the collection, may be directed to Phan Thi Ngoc Chan, Librarian for the Vietnamese Collection, at phan@fas.harvard.edu or at (617) 495-6007. For more than 140 years the library at the Museum of Comparative Zoology, now administered by the Department of Organismic and Evolutionary Biology, has served the museum and Harvard communities by providing a vast collection of natural history resources. The library is located on the second floor of the museum, at 26 Oxford St., Cambridge, Massachusetts 02138. The phone number is (617) 495-2475. The library is open to the Harvard University community, students and faculty of other institutions, as well as to the general public. The Rübel Asiatic Research Collection (RARC) is a department of the Fine Arts Library, Harvard College Library. It ranks with the Library of the Freer Gallery of Art in Washington, D.C., as one of the leading unified collections for the study of Asian art and archaeology in the nation. The Rübel Asiatic Research Collection comprises approximately 17,000 volumes devoted to the history of Asian art. More specifically, the collection focuses on the art, architecture and archaeology of East Asia, Central Asia, Southeast Asia and India. Its holdings include books, periodicals, offprints of rare and important articles, maps, rubbings of inscriptions from stone monuments, fine reproductions of Chinese and Japanese scroll paintings, auction and exhibition catalogs, and manuscripts, all brought together in a unique collection. The collection is especially strong in the history of Chinese ritual bronzes, Buddhist arts, Chinese and Japanese painting, Japanese woodblock prints and East Asian ceramics. About half of the holdings are in Chinese, Japanese or Korean. The rest are in English or Western European languages. The Houghton Library is the principal rare book and manuscript library of Harvard College. Its mission is to support research and instruction in the Faculty of Arts and Sciences and the University by acquiring, cataloging, securing, and preserving significant literary, historical, and visual materials, and by providing access to them through catalogs, finding aids, and an expert staff. The Library supports and supplements Faculty of Arts and Sciences academic programs through exhibitions, lectures, seminars, publications, and courses. Because of the richness of its holdings and the professional accomplishments of its staff, the Library serves as a resource for the entire Harvard community and for a national and international community of researchers and scholars. The Bibliography of Asian Studies contains over 545,000 references to journal articles, chapters in multi-author volumes, conference proceedings, and anthologies from 1971 to the present, as well as individually authored monographs from 1971 to1991. It covers all subjects related to East, Southeast, and South Asia. Raymond Lum’s extensive list of online resources, used for publication in the Asian Studies Newsletter. The Committee on Research Materials on Southeast Asia (CORMOSEA) is a committee of the Southeast Asia Council (SEAC) of the Association for Asian Studies (AAS). It was established to enhance the collection of Southeast Asia research materials and to assist in making them available to Southeast Asia scholars, faculty, and students nationwide. Harvard Asia Quarterly, a journal of current affairs affiliated with the Harvard Asia Center, was established in 1997 by students at the Harvard Law School and the Graduate School of Arts and Sciences as an interdisciplinary journal of Asian affairs. Founded in 1866, the Peabody Museum is one of the oldest museums in the world devoted to anthropology and houses one of the most comprehensive records of human cultural history in the Western Hemisphere. The Arthur M. Sackler Museum houses superb collections of ancient, Islamic, Asian, and later Indian art. The museum includes one of the finest collections of Asian Art in the United States. The collection is particularly strong in the arts of East Asia, but also includes modest holdings of works from India, Central Asia and Tibet, and Southeast Asia; the greatest strengths lie in the fields of Chinese archaic jades and bronze ritual vessels, Buddhist art, and ceramics; Korean paintings and ceramics; and Japanese lacquer, calligraphy, printed books, and woodblock prints. The collection includes approximately 16,000 works, some 6,000 of which are woodblock prints. The CTFS-AA Asia Program forms part of a global initiative in long-term tropical forest research, coordinated by the Center for Tropical Forest Science of the Smithsonian Tropical Research Institute in conjunction with scientific collaborators around the world. The broad objectives of the CTFS research program are: (1) to develop a general theory of tropical forest diversity and dynamics, providing explanations of the relative importance of biotic and abiotic factors in controlling species distributions and the regulation of population and community dynamics, and (2) to develop models incorporating ecological and economic analyses for predicting human impacts on and optimizing sustainable utilization of tropical forests. The program believes that these and many other fundamental ecological questions concerning tropical forests are best addressed by a comparative approach involving long-term, individual-based, mapped, permanent forest plots. The consortium of researchers and institutions collaborating with CTFS has established a pantropical network of 17 large-scale permanent plots in 14 countries representing the diversity of tropical forests in Asia, Africa, and Latin America. The information and research infrastructure available through the CTFS program provides a wealth of opportunities for local and international scientists to conduct research, and unparalleled opportunities for the education and training of students at all stages. In 2007, the world quietly passed a landmark: for the first time in our history more than half of the world’s population now lives in cities. By 2030, an estimated 5 billion of the world’s 8.1 billion people will live in cities. About 2 billion of them will live in slums, primarily in Africa and Asia, lacking access to clean drinking water and working toilets, surrounded by desperation and crime. Already these slums are huge. According to Mike Davis, author of Planet of Slums, nearly 80% of Nigeria’s urban population, or some 41.6 million people, live in slums. 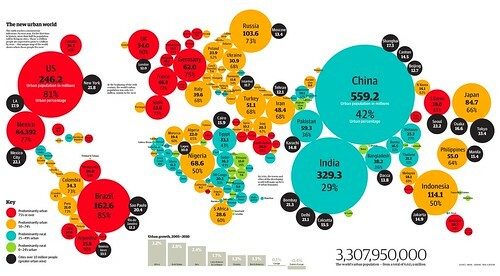 The comparable numbers in India are 56% and 158.4 million. Many of these slum dwellers are also squatters, lacking leases or legal title to their homes. Not all slums are equal. By the United Nation’s definition, their residents are missing at least some of the following: durable walls, a secure lease or title, adequate living space, and access to safe drinking water and toilets. A fifth of slum households are missing at least three of these basic needs. If the dream of a better life in the city persists. Overall, the world’s urban population is expected to grow at an annual rate of 1.78% until 2030, while rural communities shrink. Is this the future of Phnom Penh? Source: Elisabeth Eaves, Two Billion Slum Dwellers, Forbes 2007. The Challenge of Slums / United Nations Human Settlements Programme. London ; Sterling, VA : Earthscan Publications, 2003. Floods: Floods are the most frequent of all natural disasters. Between 1947 and 1981, there were 343 flood disasters in which an estimated 200,000 people died. Between 1900 and 1980, 339 million people were affected and 36 million people lost their homes. Slums and squatter settlements are frequently constructed in low-lying areas subject to periodic flooding. At the end of the Pol Pot regime, returnees to Phnom Penh were authorized to occupy buildings on a first-come, first-served basis. The few professionals alive occupied vacant dwellings close to the places of employment in the civil service. These new owners took many centrally located buildings, which some then subdivided and sold, even in the absence of formal titles. Once all buildings were occupied,people started to settle on vacant lands, creating the communities that are now considered illegal. Most came to Phnom Penh for economic reasons and settled close to where they could earn a living. Afterwards, the slum population increased through natural growth, through migration by relatives of existing slum dwellers and through seasonal migrants. 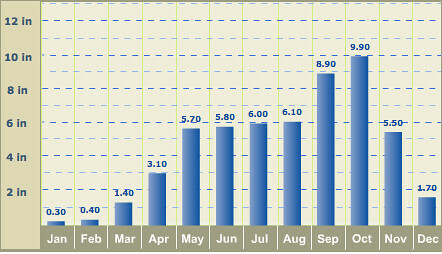 People who move regularly in and out because of floods account for seasonal variation in settlements sizes. 1 Squatter settlements: these consist of dwellers and housing units on illegally occupied private or public lands. 2 Urban poor settlements: these comprise low-income families with some sort of recognized occupancy. However, there exists no clear distinction between legal and illegal occupancy in Phnom Penh as all private ownership of land was abolished in 1974, and no clear ownership system has since been implemented. Almost no one has full ownership title and most city dwellers could be considered squatters. Slums on public lands largely developed along wider streets, railway tracks, riversides and boengs (water reservoirs). On private lands, slums tend to consist of squatting in dilapidated, multiple-occupancy buildings. Increasingly, there is also rooftop squatting in and around the city centre, while, since 1995, rural migrants have formed squatter settlements at the urban periphery on marginal public lands. Most slums are made of low-cost, recycled materials (paper, palm leaves and old wood). These structures are vulnerable to winds and heavy rains, and can be easily destroyed by fire. Those who own brick and cement houses are typically financially better off. The land tenure situation in Phnom Penh is complex as there is no clear distinction between legal and illegal occupancy and/or ownership. Although, recently, some have been granted social concessions by the government, no family yet holds any certificate of ownership. Families with a registration book may feel more secure than those without,but it does not give them any strong claim to ownership. with the constant threat of eviction by their slum landlord. Until 1999, the Municipality of Phnom Penh (MPP) kept a rigid position of not recognizing ‘squatters’ as legitimate inhabitants of the city, and its agencies did not support development activities to reach slum dwellers. Rather, they evicted squatters, often violently, without compensation or support to relocate. The municipal efforts to develop tourism in Phnom Penh led to the removal of many slum communities. Nevertheless, in 1999, the MPP and UN-Habitat, after consultations with NGOs and community-based organizations (CBOs), developed an Urban Poverty Reduction Strategy (UPRS) to improve access to basic social and physical infrastructure, enhancing economic opportunities and strengthening participatory governance mechanisms. In 2000, Prime Minister Hun Sen redefined squatter dwellers as ‘temporary residents’, while publicly recognizing their economic value to the city. He emphasized that helping them to rebuild new, liveable communities in locations outside of the city had become a priority of the municipality.This change of status coincided with a first step of implementing the UPRS. The term ‘squatter’, long used in Phnom Penh to classify most inhabitants of low-income settlements, conveys much more than a connotation of illegality. In Khmer, it refers to ‘people living in anarchy’, and is strongly linked to immorality, disorder and criminality. At the official level, this gives the MPP grounds to refuse dialogue with squatters and not to acknowledge the legitimacy of their claims for public recognition. This official view is quite widely shared by the middle and upper classes, who consider squatters an aesthetic nuisance to the city and a threat to public order, all feelings based on the same stereotypes of anarchy and reinforced by a poorly informed media. Relations between the MPP and poor communities remain tense as, until recently, the MPP did not engage in dialogue with representatives of squatters, who were considered illegal. In this way, the most vulnerable populations are not included in the political process. MPP governance is severely restricted by the limited authority to plan and finance its activities. Although the MPP officially gained financial autonomy in 1998, its budget remains constrained as a national law predefines all lines, the minister of interior must approve the budget and the national assembly ratifies it. In addition, the city has little power or incentive to raise its own revenue. • the general perception of the problem of illegal squatters rises above the level of ‘places where anarchy and confusion reign’. Campbell, Robert Wellman, ed. 1998. 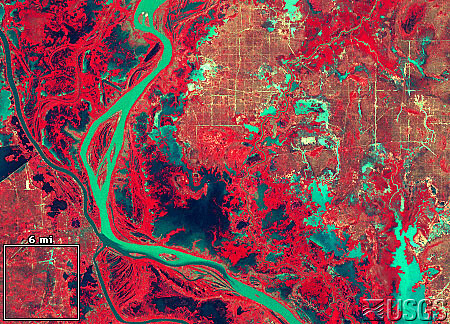 “Phnom Penh, Cambodia: 1973, 1985.” Earthshots: Satellite Images of Environmental Change. U.S. Geological Survey. 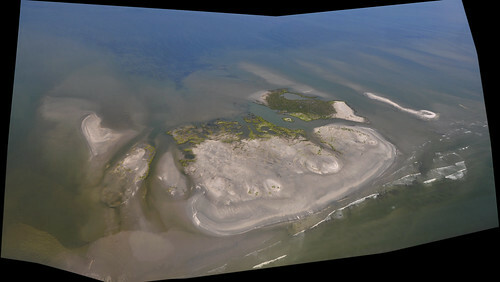 http://earthshots.usgs.gov. This article was released 1 January 1998. From 1975 to 1978, Cambodia was ruled by the brutal Khmer Rouge regime, which sought among other things to build a vast system of irrigation canals. These images show an area around Cambodia’s capital city of Phnom Penh where such waterworks were built. Many areas east of the Mekong River, appearing tan in the 1973 image, show a half-kilometer gridwork in 1985. This area receives 152 to 203 cm of rain annually, most of which falls during the southeast monsoons from mid-May to early October. Landsat images are effective for quantifying changes in surface water. While the images were both acquired after the monsoon season, the 1985 image clearly shows more surface water than the 1973 image. From 1975 to 1978, Cambodia was governed by ideological pro-Chinese communists known as the Khmer Rouge (“Red Khmer”), who gained a reputation for extreme brutality. Even Pol Pot, the Khmer Rouge ruler, claimed that 10% of the population died (800,000 of 7-8 million), and other estimates were higher.11 Many of these deaths were from hunger, disease, war, and forced work, but there were also mass executions. Defense Mapping Agency, 1973 (compiled 1968, revised 1973), Operational Navigation Chart K-10: edition 7, scale 1:1,000,000. One person you want to talk to is Damien Evans at Univ Sydney, who directs the Greater Angkor Project. Despite the historical emphasis they have also done some interesting Remote Sensing work on Cambodia. GADM provides basic vector data for Cambodia (and all other countries). You could start by getting the countries of interest in SE Asia. You may try to contact CSEAS Library, Kyoto University, or the developer, Xianfeng Song. The Cambodian Water Festival (variously spelled in the original Khmer as Bon Om Touk, or Bon Om Thook, or Bonn Om Teuk, or Bon Om Tuk) takes place once a year, on the full moon of the Buddhist month of Kadeuk (usually in November). It celebrates a major natural occurrence: the reversing flow between the Tonle Sap and the Mekong River. For most of the year, the Tonle Sap empties into the Mekong River. However, when the rainy season arrives in June, the Mekong rises, reversing the flow to dump water into the lake, increasing its size ten-fold. When the rainy season ends in November, the Mekong drops once more, allowing the current to reverse again, emptying the excess waters of Tonle Sap back into the Mekong. This natural occurrence is celebrated in Cambodia with three days of festivals, fluvial parades, boat races, fireworks, and general merriment. Then as now, Tonle Sap is a major focus of life for many Cambodians. It’s a source of livelihood for fishermen and farmers alike – it’s rich in fish stocks, and the silt deposits left by the floods fertilize the fields. No wonder Cambodians have celebrated Bon Om Touk for centuries – it’s a way to give back to the river that’s given them so much. Bon Om Touk dates back to the 12th century, to the time of the Angkorian King Jayavarman VII. The Water Festival was celebrated by the King’s Navy to kick off the Cambodian fishing season – the fluvial festivities are meant to keep the river divinities happy, ensuring a bountiful harvest of rice and fish for the year to come. Loy Pratip: an evening fluvial parade, featuring beautifully-illuminated boats lighting up the waterways. Government institutions sponsor each of the boats on parade. Sampeas Preah Khe: the salutation to the moon. The full moon is supposed to be a good sign for the coming harvest, which is why Cambodians make sure to give thanks to it on Bon Om Touk, and pray for a bountiful harvest ahead. Auk Ambok: at midnight, celebrants gather at temples to eat ambok (“flattened rice”), a holiday rice dish. Ambok is simply rice fried in the husk, pounded to remove the husk, and mixed with banana and coconut. Vann Molyvann, Cambodia’s most distinguished architect studied at the Ecole National Superieure des Beaux Arts in Paris after the Second World War. During the Sangkum Reastr Niyum regime (1955–1970) Prince Norodom Sihanouk enacted a development policy encompassing the whole kingdom with the construction of new towns, infrastructure and architecture. Vann was the foremost of a generation of architects who contributed to the unique style of architecture that emerged during this era and that has been coined New Khmer Architecture. It is one of the standard critiques of the Modernists of Vann’s generation that their grandiose designs crushed the street-level urban fabric and ignored environmental sustainability. Vann’s case stands this critique on its head. His 1960’s vision for Phnom Penh epitomizes the grandiose optimism of ”la Ville Radieuse,” the French version of midcentury utopian urbanism. Yet it was Vann’s city plan that paid exquisite attention to Phnom Penh’s environmental concerns and urban fabric, while the privatization and decentralization of the last 15 years threaten to scar the city’s landmarks and wreak havoc with its water management. In 1970 the Sangkum Reastr Niyum came to a brutal end with the coup d’état led by General Lon Nol. Vann relocated to Switzerland with his family. He worked for the United Nations Human Settlements Programme for 10 years before eventually returning to Cambodia in 1991 where he served as President of the Council of Ministers, Minister of Culture, Fine Arts, Town and Country Planning. Many of Vann’s most important buildings, having managed to survive a civil war, American bombing, the Khmer Rouge and the Vietnamese occupation, are now threatened by the rapid and chaotic development of Phnom Penh. In 2008, two of Vann’s greatest buildings, the Preah Suramarit National Theater and the Council of Ministers, were demolished. No comprehensive record of the work exists. 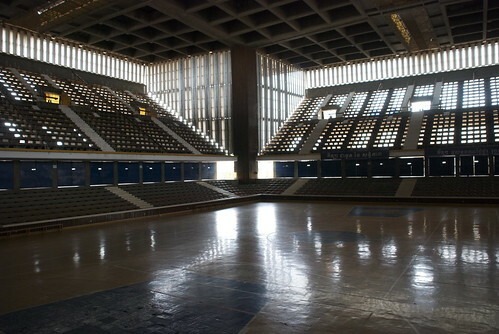 The Van Molyvann Project is dedicated to preserving the architect’s work http://www.vannmolyvannproject.org/.